Pittsford Village Hall is located at 21 North Main Street, Pittsford NY 14534; phone: 585-586-4332. The village was incorporated in 1827. Photo: Rebecca R. Gombach, photographer. The first white men known to have visited the area which is now the village of Pittsford were the soldiers in the army of the Marquis de Denonville, renowned for his expedition against the Seneca Indians in 1679. They bivouacked at Big Spring, a well-known Native American meeting place. The first white settlers of the area, Israel and Simon Stone, arrived in 1789 and erected the first crude dwelling near Big Spring. According to local tradition, the Stones' dwelling is incorporated in the structure at 38 State Street, a Greek Revival style farmhouse several blocks east of the Pittsford Village Historic District. The fertile land of the region attracted many settlers, and by the late 1790s the community was comprised of emigrants from eastern New York State, New York City, Vermont, Massachusetts and England. Land speculation became an extremely profitable enterprise, the speculators and capitalists prospered, and the young village became a thriving business center for the surrounding farmlands. Pittsford is the oldest of Monroe County's 10 incorporated Villages. The Village was part of the Phelps and Gorham purchase sold through the land office at Canandaigua. The Village was first settled in 1789 when Israel Stone built a log home, the Village's first building, adjacent to "The Big Spring". During the first decade of the 19th Century a hamlet began to form a mile south of the present "Four Corners" near the present location of the Pioneer Cemetery. This settlement quickly became the political and social center for the Town of Northfield, which originally encompassed the eastern half of Monroe County. As soon as the route of Governor Clinton's Erie Canal was plotted, development of the young settlement migrated north to its current location. In 1814 Samuel Hildreth established a stagecoach line that grew to serve most of Western New York. The stage business led to the establishment of a number of hotels in the Village of Pittsford. After the Erie Canal opened in 1822, the Village grew rapidly as speculators, contractors and merchants made fortunes from canal trade. The Village's surviving legacy of Federal Style architecture is evidence of the prosperity derived from the canal. By the 1830's Pittsford was eclipsed by the enormous growth experienced by the nearby Village of Rochesterville. However, the arrival of the Rochester & Auburn railroad in 1834 assured Pittsford would remain an important shipping center for local produce and grains through the 19th and 20th Centuries. Today the canal warehouses are an important element of the Village's historic character. The transformation of Pittsford from a farming community into a suburban community began when affluent Rochesterians built country estates during the second half of the 19th Century. With the construction of the Rochester & Eastern Trolley line and the development of the automobile, Pittsford was within easy reach of Rochester and the Village began to experience increased residential development. Johnstone, Janetta, N. Y. State Division for Historic Preservation, Pittsford Village Historic District, nomination document, 1984, National Park Service, National Register of Historic Places, Washington, D.C. 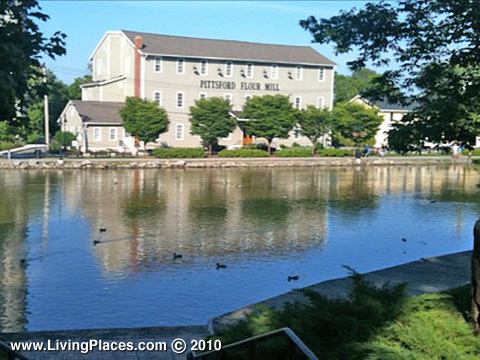 Village of Pittsford NY, Board of Trustees, Comprehensive Plan, 2006, villageofpittsford.org, accessed February 2009.